Every brewmaster has a story, and so do the beers they create. Adopting this philosophy of community and storytelling, I spoke to Tom Horst, who has become a new type of local celebrity – small town boy turned Ph.D. symphony percussionist turned high school band instructor turned brewmaster and founder of Crystal Springs Brewing Co. of Louisville – to have a conversation about life, and of course, about beer. 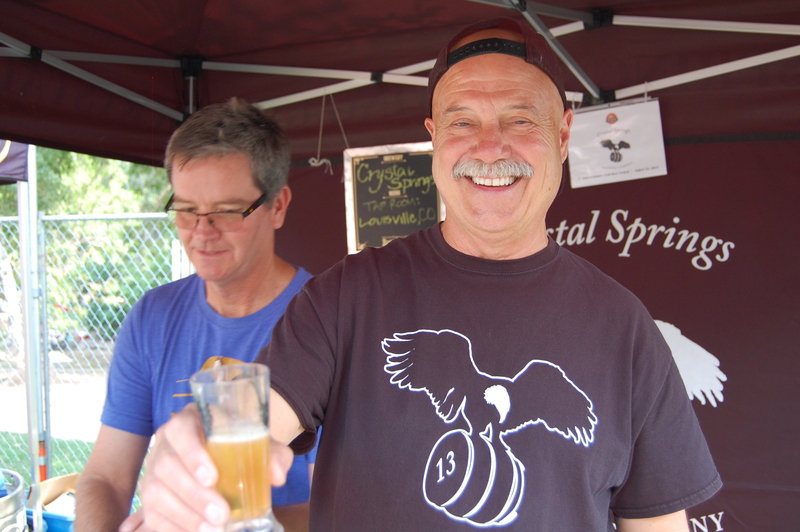 It was a sunny late summer afternoon when I walked into Crystal Springs Brewing Company. I sipped on the Cream Ale, which was fermented in white wine barrels, while head brewmaster/owner Tom aka “Doc Shredder” entertained questions ranging from how he survived the Colorado floods of 2013 to his love for barrel aging to sending his kids to college and his life after retirement. Me: How is it going? How was your summer? You just finished checking one daughter in to CSU, still recovering from surgery…anything else? (I forgot to mention recently retiring from Boulder High School after 27 years, which was where students and faculty started calling him “Doc”). Doc: It’s been quite the summer. The sewer backed up into our basement – (that) doesn’t sound pretty at all (chuckle). We started tearing out the carpet, then it dawned on us that our insurance might cover it, which it did, anyway they discover asbestos (at his house in Sunshine Canyon). Me: You guys still up in Sunshine Canyon? Me: How long have you guys lived there? Me: I heard (your home) was in the flood (of 2013), so you already rebuilt it and then another “flood”? Doc: (Laughing) Yeah! Right. We finished it and we’re moving back in now so we’re trying to be organized about it. We’re getting rid of stuff – I think you collect a lot of stuff over 20 years – a lot of stuff you don’t need…Then I had double hernia surgery, so I’m pretty much recovered from that though, I think. So it’s kinda nice to get back in the swing of things. Me: How’s the beer doing? Doc: Good. Probably too good! We’re in a spot where we can’t make enough to keep up. So we bit the bullet and we’re expanding. Around November we should get new equipment. Me: So you’re going to stay here, just expand the brewery side? Doc: Yeah. A larger brew house basically. Me: What’s your capacity currently? Crystal Springs’ current brew house is a 2 bbl system, but will be upgraded to a 15 bbl system this November. Photo by Rachel Dugas. Doc: It’s a 2-barrel system and we brew about 30 to 35 barrels a month. And this will allow us to up that to 100 or so. So about tripling capacity – and the potential’s there for more – we can add more fermentors and so on. He added (in email): We are expanding to a 15 bbl system in November, which will increase our capacity considerably. At that time we will be moving our 2 bbl brew house back up to Sunshine Canyon, along with all our barrels. We will be devoting the Boulder location to production of barrel aged beers, sour beers, experimental beers and one-off beers and doing all our main production beers at the Louisville location. Hopefully, this will allow us to meet demand and then some! 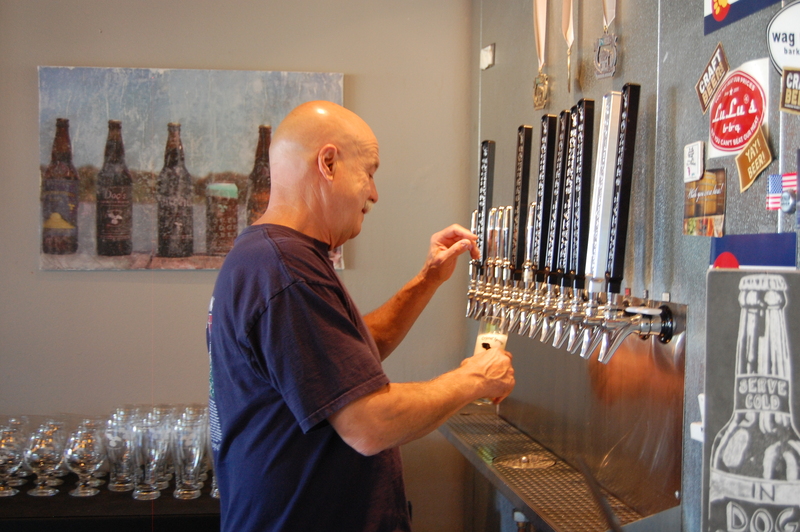 (Tom has kept his brewing license and permits to operate a fully functioning brewery from his home even after moving the brewery to its current location in Louisville). Doc: Well that was our intent; it wasn’t our first business plan to go where it has gone. It was more for the first year or two, we were within 2 miles of our house – where we had the brewery – it’s still there, actually, in the garage – we’re gonna do all our barrel aging stuff there. Tom Horst, founder of Crystal Springs Brewing Co in Louisville. Photo by Rachel Dugas. Doc: So, it just kinda took on a life of it’s own I guess, (chuckle). We made the decision to get larger. Me: When you first started, was this sort of your retirement plan? Doc: Kinda, yeah. We had the two girls (Horst and wife Kristy’s twin daughters, Jacey and Kelsey) going into college, and (Crystal Springs) was just a way to make a little extra money. Me: Do you have other kids too? Doc: I have an older son and daughter and Kristy has a daughter from a previous marriage. I started brewing with my son, he’s the one who got me into it. He’s a doctor out in Sacremento. Then my daughter lives in Thornton – she has 4 sons. Me: Do you have other grandkids as well? Doc: Yeah, my son has 3 kids – two boys and a girl. So I have 7 grandkids – 6 boys and 1 girl. Me: Wow! So you haven’t always been into brewing? Doc: Well I’ve always been into beer – but my son and I – he came out here (to Colorado) to go to college and live with me, but I’d always try to seek out better beer, so to speak. So, when he’d say ‘Hey, we can legally brew beer,’ we thought that’d be fun – and we made our first batch and it turned out pretty good and we were hooked. 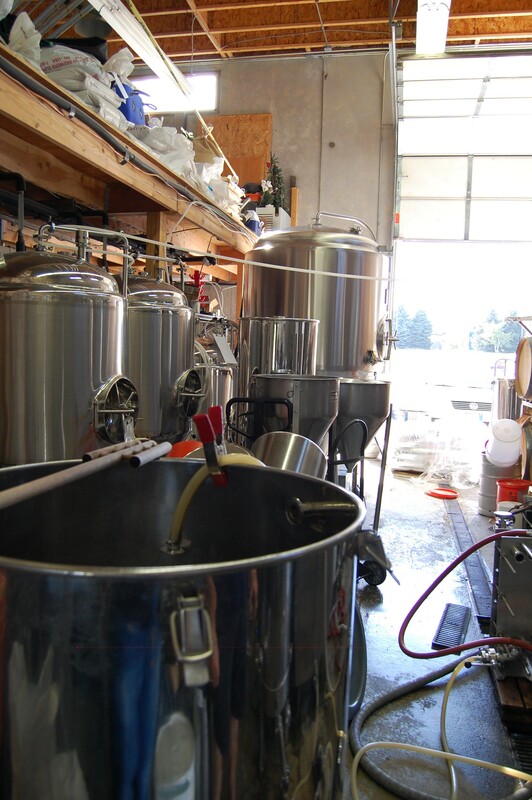 (He later added that at the time he and his son started homebrewing, they were limited to create beers based on what supplies local homebrew supplier who called himself “Colonel John” had on hand. Later, he and his son decided to become BJCP-certified, which he credited for his knowledge of different beer styles that took his home brewing to the next level). Me: Is he (your son) a partner in the business? Doc: No. He wants to start his own brewery and now he’s leaning toward starting a taphouse, I don’t know where he’s going now. He’s pretty busy – I think – he works at UC Davis hospitals and works with juvenile delinquents. Doc: He’s a child psychiatrist. So, I think that between his family and work and stuff I don’t think he has a lot of time. Me: So your son’s a child psychiatrist and you were a high school teacher, is that something you have in common – wanting to work with adolescents? Doc: Well I started out as a professional musician. My goal was to play in a symphony and teach in a college and I did that – for a while. And then one thing led to another and I ended up getting out of that. I had a resort for a while. Tom Horst aka “Doc Shredder” pours a kolsch at Crystal Springs’ taproom in Lousville. Photo by Rachel Dugas. Horst later explained how his graduate school class was the first generation of college trained percussionists to receive their doctorate in symphony percussion – his coming from West Texas State University, which he earned before he became a music teacher at Boulder High. Doc: Then I headed out to Denver and kinda fell into the job at Boulder High and fell in love with the job. I Really liked the kids – I liked working with them. And the staff was great. So I ended up being there for 27 years. Really enjoyed it. (He retired this past May). Doc: Husdon (grinning)…a little tiny town in South Dakota. Me: I can imagine there was a lot of cold winter beer-and-Scotch drinking that goes on in South Dakota. Doc: Not so much Scotch! I didn’t have Scotch until my daughter married a guy – she went to University of Edinburgh – she met her future husband there. He was from Newcastle, England – right on the border of Scotland. I was visiting them once, and he told his friends to bring over there “whisky” as they call it. They asked me to try it and write about it. (Laughs). I really got to enjoy it – can’t afford it now, but. (chuckle). Doc: It’s a very nice “sipper” type of drink, you know? Me: So you’ve pretty much traveled the world then? Doc: Not really, but kinda, yeah. Me: When was the first time you ever tried a beer? Doc: (Hearty laughter). My mother wouldn’t like this story. I think was in the eight grade and I was at a (sleepover) with a friend of mine, and his parents went out for dinner or something – I don’t know – and we snuck a beer out of the refrigerator and went out into the woods and tried it. I don’t remember what it was. I was like a Hamm’s or a Graybeal or something. Me: And what did you think? Doc: I thought it was pretty good. Me: Really? Wow. I haven’t heard of anyone liking beer the first time they tried it. What were you like in high school? Were you a “troublemaker”? 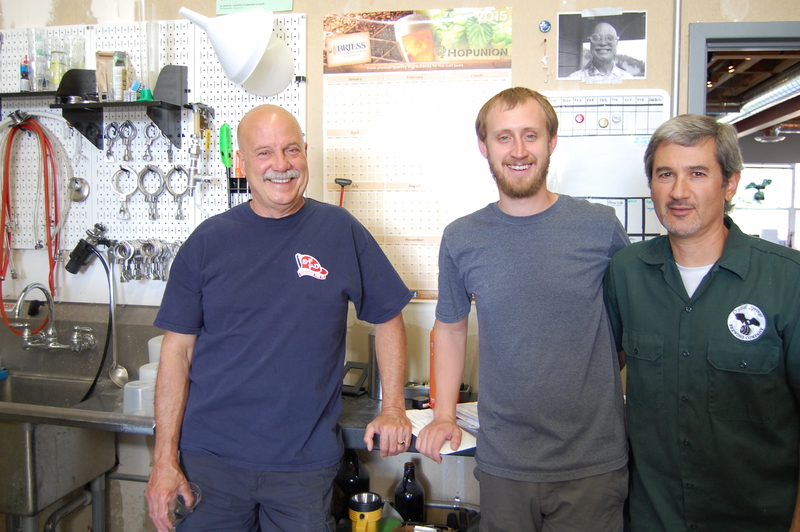 Head Brewmaster Tom Horst, Brewer Colin Woods and Bartender Jon Dosik. Photo by Rachel Dugas. Doc: Well I got into my fair share of trouble, but I wouldn’t call myself a troublemaker. You know, it was a little tiny high school so if you wanted to do anything, everybody had to. So, I played basketball and football and did track, and baseball in the summertime, and I was in choir and band and theatre…I was just kind of a jack of all trades I guess. Me: Very popular with the ladies? Doc: Was I? (Laugh) I don’t think so! Me: Did you have any high school teachers that you remember today? Doc: Yeah. A guy named Earl Nebelsick – he was the basketball coach and the math teacher. My mom taught at the high school off and on. Me: What did she teach? Doc: It was called commercial – English and commercial. I only took one class from her – typing. Me: Is she still alive today? Doc: Yeah! She just turned 91. We have several beers named after her. (chuckling). 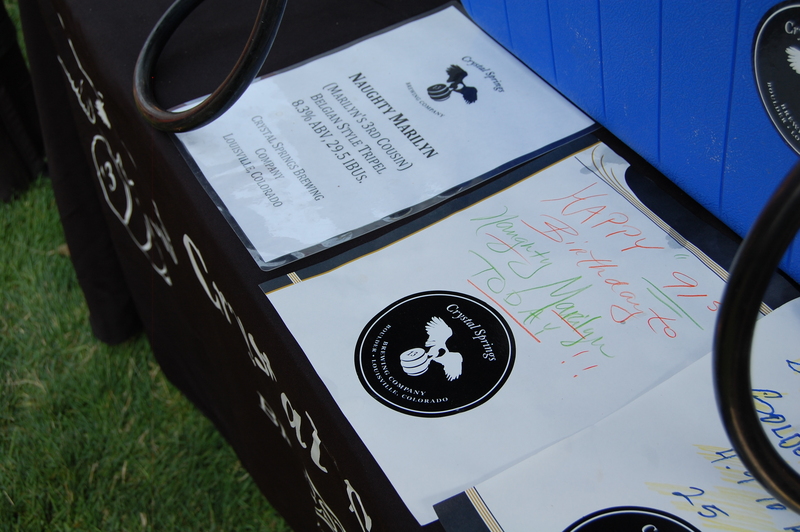 Happy Birthday “Naughty Marilyn;” Horst’s mother, Marilyn, is the inspiration behind the beers. She recently turned 91 years old. 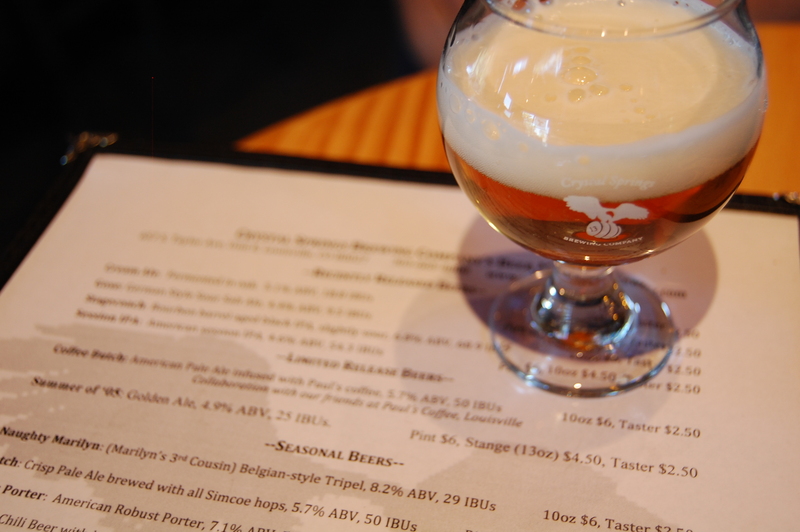 “Naughty Marilyn” is a Belgian style tripel. Photo by Rachel Dugas. Me: Is your mom Marilyn? Me: Is your mom sassy? Doc: No. Not at all. She’s a very strong woman, but not evil in any way, shape or form. That’s why it’s kinda fun to have “Naughty Marilyn”. (giggle). I don’t think she liked that when we first did it, but she’s adapted to it – she’s okay with it now. Me: Does she drink beer? Doc: I was born on the 13th (of July), my son was born on the 13th (of November), and he has a daughter that was born on the 13th of April. I have a niece who was born on July 13th. The number seems to keep coming up in our family so we just adopted it. (Crystal Springs uses the signature name “13” for their bestselling classic American IPA- read our thoughts on “13”.) *Crystal Springs also celebrates monthly with their 13th of the Month celebration, with special tappings and more. Doc: After Kristy and I got married, her brother and sister’s husband invited me to attend Warren Miller (ski) films each year with them. One year there was a chance for people to sign up to win prizes (ski pass, skis, etc.). My brother-in-law, Bill, said he was going to go sign up. I asked him if he would sign me up as well. He did, but used the name Doc Shredder (shredder from the name ski boarders were often called – not that I was a boarder!). Anyway, that was about 17 years ago and I still get junk mail addressed to Doc Shredder. Crystal Springs’ “Coffee Butch” is a pale ale infused with Paul’s Coffee of Louisville. Photo by Rachel Dugas. 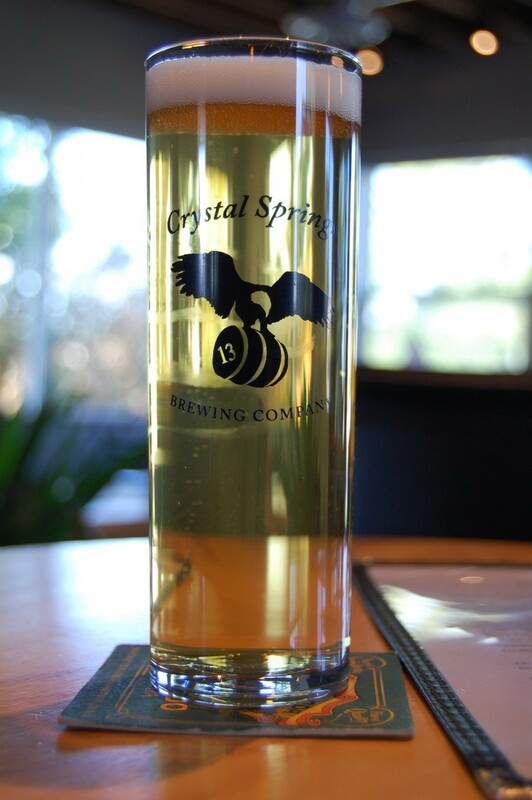 Crystal Springs’ brewery and taproom is located in Louisville’s industrial hub, just off of Dillon Road. The address is 657 S. Taylor Ave., just south of Mountain Kids Louisville. Check the website for special tappings, including “Coffee Butch” (“Butch” is the nickname of Horst’s son Bob, who was named after his father, Robert), which I had the pleasure of tasting. Made with Louisville’s Paul’s Coffee (of Paul’s Coffee & Tea), the pale ale is accentuated with robust cold-pressed coffee, resulting in a beautifully balanced coffee pale ale. Try it if you can – it will be on tap by this Thursday! Stay tuned for Crystal Springs’ fall and winter releases including an American wild sour pumpkin beer, a new IPA, and several barrel aged beers including their award winning Port Barrel Aged Black Saddle (Russian Imperial Stout), a wine barrel aged stout, an awesome rye/bourbon barrel aged stout and a sour rum barrel aged porter. All but the barrel aged stouts will be coming out this month. The barrel aged stouts will be released on November 13, 2015 (13th of the Month celebration) – on tap and in bottles. Super fans, stay on the lookout for the rum barrel aged Doc’s Porter, which is gracefully aging as we speak. Previous Previous post: EDB Spirit Awards of GABF 2015 – Now with BEER GEEKS!